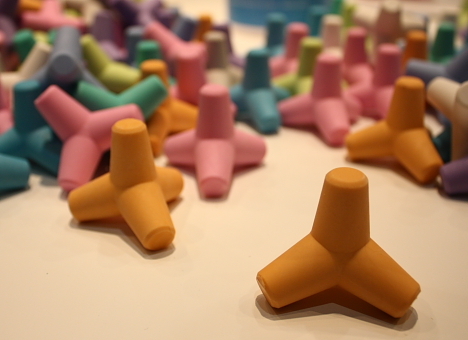 These TETRA erasers spotted at the recent Good Design Expo in Tokyo are the perfect editing tool for pencil-pushing tetrapod enthusiasts. Produced by Sun-Star Stationery Co., Ltd., the shapely erasers come in 9 colors and are available at stores like Tokyu Hands for 120 yen (about $1) a pop. Pile them on your desk to inspire daydreams of the beach in Japan. I am from Brazil and I have a small company that uses the tetrapod in the logo. I am thinking to use the erasers to promote the brand. But here we not have this product. 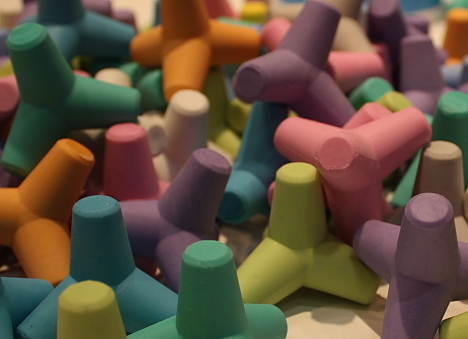 If I send money to you, can you buy it and send me a package with 100 erasers for example? If possible I will be very happy. Thanks! and congratulations for your blog. Best Regards.